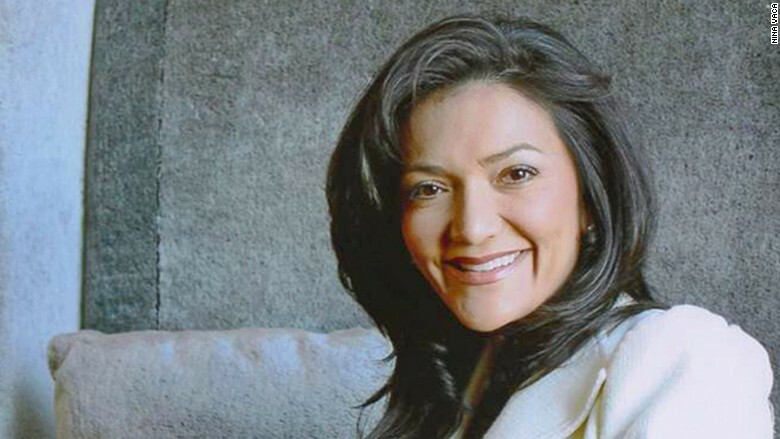 A child of Ecuadorian immigrants, Nina Vaca knows how to turn a challenge into an opportunity. At age 25, she started staffing company Pinnacle Group with just $300. Now, 19 years later, it generates $650 million in revenue a year. But it hasn't always been easy. The business was hit hard after September 11th and again during the Recession. But instead of cutting back, Vaca reinvented and expanded -- gambles that paid off. Vaca has shown similar resilience in the face of personal tragedy. At age 17, her father, Hernan, was killed during a robbery at the travel agency he owned. Even though she was still in high school, Vaca and her sister Jessica took the reins. Together, they balanced the agency's books and prepared the business for sale. After a year, they sold it successfully and Vaca went off to Texas State University. "If I had taken a different route at 17, I'm sure people would have understood," she said. "I think the love and strength of my family gave me the courage to walk the straight line and to get ahead." Besides running Pinnacle, Vaca is a Presidential Ambassador for Global Entrepreneurship and sits on the board of three companies: Comerica Bank, Kohl's and Cinemark. She's also only one of two women to ever serve as chairman of the U.S. Hispanic Chamber of Commerce -- and the only Ecuadorian. "I'm my dad's legacy," she says. 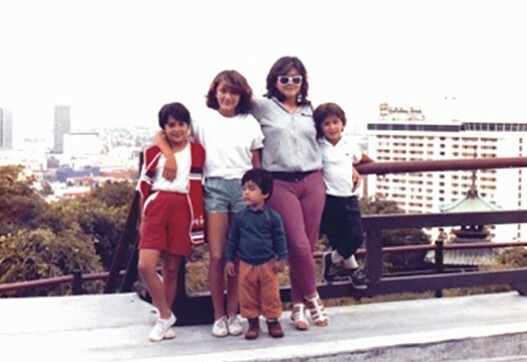 I was one of five children in an immigrant family that came to Los Angeles from Quito, Ecuador. We had humble beginnings, but my parents were entrepreneurs and civic leaders so from the time we were young we were taught to work hard and contribute to the family business and the community. My dad's brother, Ramiro, came to the U.S. first. He called my dad for a job at the gaming company where he worked making checkerboards. 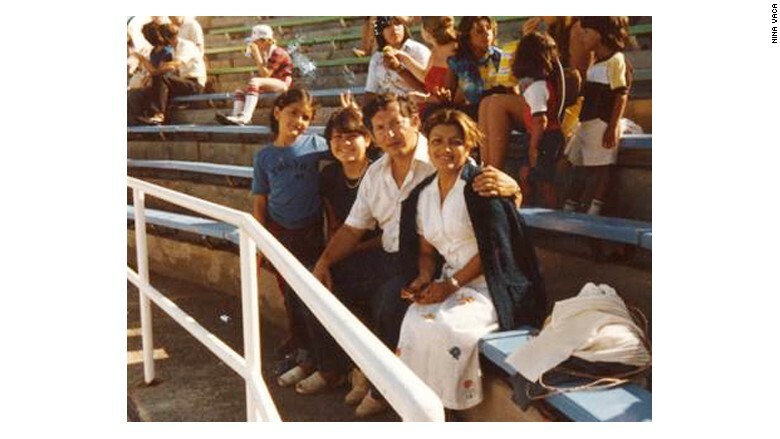 Soon after the call, my mom and dad left Ecuador to find the American Dream. After immigrating to the U.S., Nina's parents became very involved in their community. My father ended up working multiple jobs: Sanding checkerboards, parking cars at night and whatever else came around. Eventually, he became an entrepreneur. Among his businesses he ran a travel agency, which was the most stable and longest business he had. That was what put food on the table. I started working at age 10 at my dad's travel agency selling bus passes, I worked the swap meet, at a gas station, in retail. I can look back with gratitude that my life growing up was filled with hard work, love and hope. Describe how you fit into the neighborhood where you grew up? Nina Vaca is one of five children. We moved a lot when we were children. Education was a priority for my parents and they worked very hard to get us into the best public schools they could. They would strive to move us to a house and a neighborhood with better schools. But oftentimes, we would lose the lease or have the house foreclosed and we'd have to move back to the Sepulveda neighborhood in Los Angeles. Despite a lot of moves and a lot of change, I persevered in getting the best education I could. As a teenager I left the house at 5 a.m. to take an hour and a half long bus to a better school. I learned early on not to let barriers get in the way of important life goals. What was the biggest business hurdle you've encountered? As an entrepreneur, I have faced many tough moments -- but the most dramatic was in 2001 right after 9/11. I had just given birth to our second child -- of what would be four -- and the economy had frozen after the national tragedy. 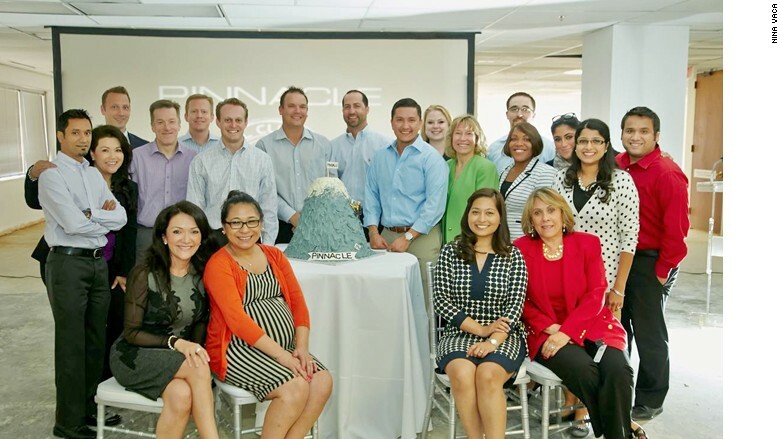 Pinnacle's traditional business of staffing had all but dried up since corporations didn't want to expand at this time of uncertainty and shock. At one point, Pinnacle was on the verge of liquidation, but today it's worth $650 million. We were at the brink of a liquidation plan when we decided to change course from being a traditional staffing agency. We knew that companies still needed to get help so we started bidding to get project work. After 40 attempts to get business from a major customer, we won two clients. It was a foot in the door. Today we are a $650 million company on target to reach $1 billion in the next year. Do you think you had to work harder than most of your peers to get ahead? There is no question that I worked harder than my peers but that was out of choice -- not because I felt required to. I have always been my own competitor -- and I believe that in a country like the U.S. there is tremendous opportunity. I am a fierce contender in business and in the triathlons that I thrive on -- I have done a half Ironman race as well. But when I compete against my own expectations for myself, I know I will do my best. What was your "big break"? One exceptional breakthrough client believed in us in 2007 -- so much so that they awarded Pinnacle a $100 million contract. This expanded our capacity in a breathtaking way:  we tripled our revenue, expanded from a handful of states to 49 states across the country, and put us on the path to the growth that we have achieved since then. 2013 was another pivotal moment when we partnered with Comcast, whose shared values and mission has helped fuel our growth and put us on track to reach $1 billion in sales. We are so grateful to have partnerships like these. Who is the one person that helped you get where you are today? My mother. She is my toughest critic and my biggest cheerleader. A woman with incredible vision -- and as an entrepreneur and civic activist -- she has always held me accountable for making a meaningful and substantial contribution to the people and places where I live and that Pinnacle Group touches. Nina with her mom, Amanda. She taught me to dream big, think big and always remember that we have the chance to make history. She remains unimpressed with business accomplishments, but is most proud of me when, through our philanthropy or my work in the Hispanic business arena, we help connect people to opportunity and create jobs for families. 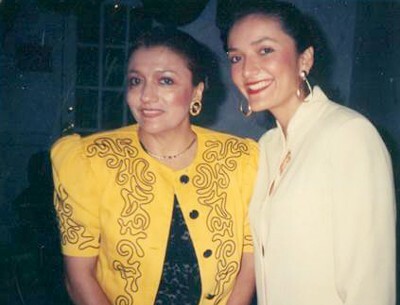 Today she still inspires as the Commissioner of Human Rights for Ecuador. We say in our family that at 4 foot 11 inches, we all look up to her. What's the one thing you do every day that helps you achieve your goals? Confidence. What I do every day is believe that I can make a difference. 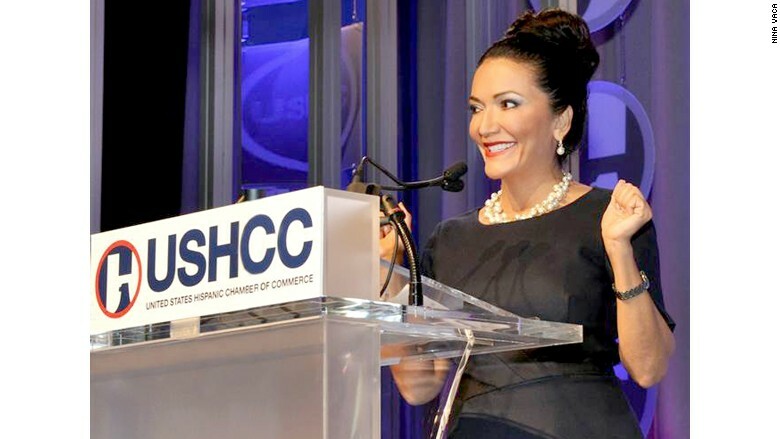 Nina Vaca is chair Emeritus of the United States Hispanic Chamber of Commerce. How do you define success? And do you think you have achieved it? My definition of success has changed throughout the years. In my younger years, success was represented by a monetary goal. Now, with more years behind me than perhaps in front of me, I correlate success with being fulfilled and happy. That's why as a business owner the success of Pinnacle Group has enabled me to feed my family. But what I do in the community feeds my soul.